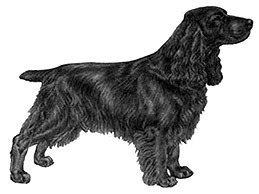 Conveys the impression of high breeding, character and nobility. Well chiselled, occiput well defined, lean beneath eyes. A thickness here gives coarseness to whole head. Slightly raised eyebrows. Moderate stop. Nose well developed with good open nostrils. Muzzle long and lean neither snipey nor squarely cut. In profile curving gradually from nose to throat. Wide open but almond shaped with tight lids showing no haw. Grave and gentle in expression. Dark hazel in colour. Chest deep and well developed. Ribs moderately well sprung. Length of rib cage is two thirds of the body length. Back and loin strong, level and muscular. Docked: Docked by one third. Set on low. Never carried above level of back. Nicely feathered with lively action. Undocked: Set low. Never carried above level of back. Nicely feathered with lively action. Reaches approximately to the hocks. Of moderate length in balance with the rest of the dog.